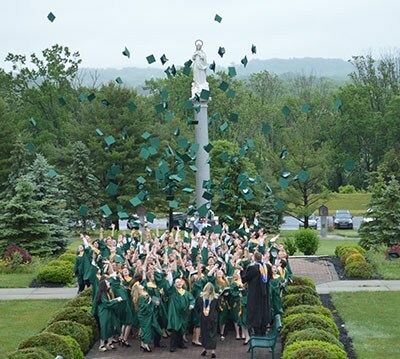 We believe Lansdale Catholic High School is a faith community of teachers and students, of parents and pastors, of friends and benefactors, united in the Catholic faith as a response to the command of our Savior to teach all peoples. We serve the needs of 9th to 12th grade youth, providing them with the opportunities necessary to grow spiritually, intellectually, emotionally, psychologically, socially and physically. We are a vigorously Catholic institution built on the belief that all persons are children of God, called to a life of oneness with Him here and for eternity. Our policy has been to make our students aware of their responsibilities as individuals and as members of a community: local, national and global. Cognizant of the individuality of students with their interests and academic abilities, teachers make a concerted effort to develop students into well-integrated, self-reliant persons who will bring a strong sense of Catholic values in meeting their religious, civic, personal and social obligations. Each student is directed to recognize and esteem personal worth by a faculty and administration, which communicates a constancy of purpose in a caring, Catholic atmosphere. Mindful of parents as the primary educators of their children, the administration and faculty perceive the work of the school to be the formal education of the students in the arts and sciences, providing an excellent preparation for their post-secondary careers. We attempt to work with parents who are our student's primary educators in supporting all phases of their children's interests. At the same time, we balance our efforts between providing for the academic needs of the individual student and the well-being of the school. As an institution the Lansdale Catholic High School philosophy for education is based on Catholic principles and practices. By making the Lansdale Catholic community aware of this philosophy, we try to help our young people to understand themselves, to develop their intellectual capacities, to form right judgments, to foster a sense of values, and to prepare them to become adult, Catholic Christians.